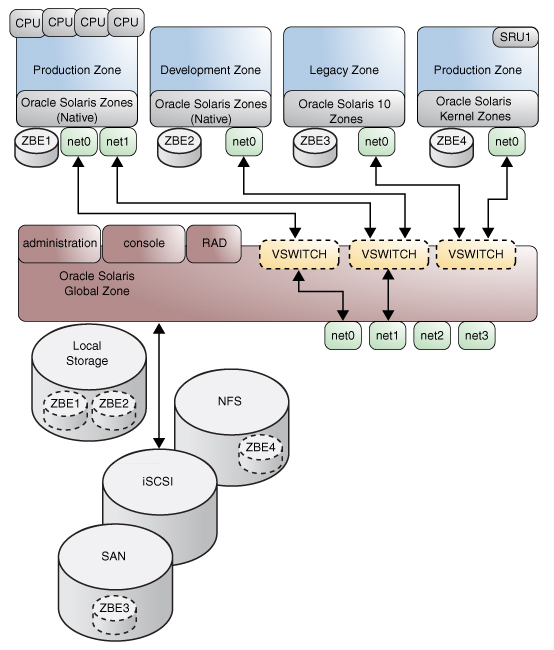 Continuing my series of posts on how to use Oracle Solaris in Oracle Cloud Infrastructure (OCI), I'll next explore using Solaris Zones in OCI. In this post I assume you're somewhat familiar with zones already, as they've been around since we released Solaris 10 in 2005. Before diving in, there's a little terminology to review. The original zones introduced in Solaris 10 are known as non-global zones, which share a kernel with the global zone but otherwise appear to applications as a separate instance of Solaris. More recently, we introduced kernel zones in Solaris 11.2. These run a separate kernel, with specialized network and I/O paths that behave more like a paravirtualized virtual machine. There are also Solaris 10 branded zones, which emulate a Solaris 10 environment on a Solaris 11 kernel. All of the brands of zones provide a Solaris-native virtualization environment with minimal overhead that can help you get more out of your OCI compute resources. The image at the start of this post from the Solaris 11.4 documentation shows a complex zones environment that might be built anywhere, including in OCI, but this post provides a basic how-to for getting started with non-global and kernel zones in the OCI environment. Now it's time to configure the zone. The key requirement is to configure the anet resource to use the VLAN tag, IP and MAC addresses assigned to the VNIC by OCI, otherwise there won't be any network traffic allowed to or from the zone. Note that you need the prefix length from the VCN configuration. We also set the default router in the zone configuration to ensure it can reach resources outside its local link (by convention the router is the first address on the network). Once the zone is configured, install it as usual with zoneadm -z ngz1 install, then boot it, login via zlogin, and verify the network works. As before, proceed to install the zone and boot it using the zoneadm command. There's plenty more to explore in using zones with OCI, consult the zones documentation for more details on their capabilities. I still have a PoC with Zones on my own todo list, and I look forward to cross-checking with your article when I do it.